Tred Avon waterfront located just 12 minutes from both Easton and Saint Michaels. Tucked away in a quiet, waterfront neighborhood, yet close to the amenities of both Easton and St. Michaels, Acorn Point provides the best of everything: comfort, convenience, and elegance. This well-appointed home offers broad water views at the end of a tree-lined drive. 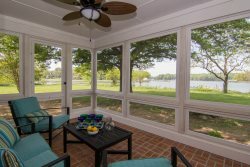 With plenty of breathtaking options for enjoying your surroundings--from the porches, balcony, or the many waterfront windows--you'll wish you lived here! There are multiple spacious rooms, including a club-like family room with a full-size pool table, which will provide plenty of space for everyone in your group. A Captain's Walk on the third floor offers incredible 360 degree views. Each bedroom is roomy and beautifully furnished, with either a private or shared bathroom attached. The light, airy feel of this house is as welcoming as it gets! Outdoors, you'll enjoy the large, private yard, swimming pool, and gardens. If you want to venture beyond the property, the house is located on a residential two-mile loop, making it perfect for quiet morning walks and afternoon bike rides. A short drive into the town of Easton will give you plenty of opportunities to shop, eat at wonderful restaurants, or enjoy live music in the historic Avalon Theatre. An equally short drive into St. Michaels will provide more small-town charm with shops, restaurants, and the waterfront Chesapeake Bay Maritime Museum. Every effort has been made to ensure the accuracy of the images, descriptions, and amenities shown above. Although they are deemed reliable, they cannot be guaranteed.